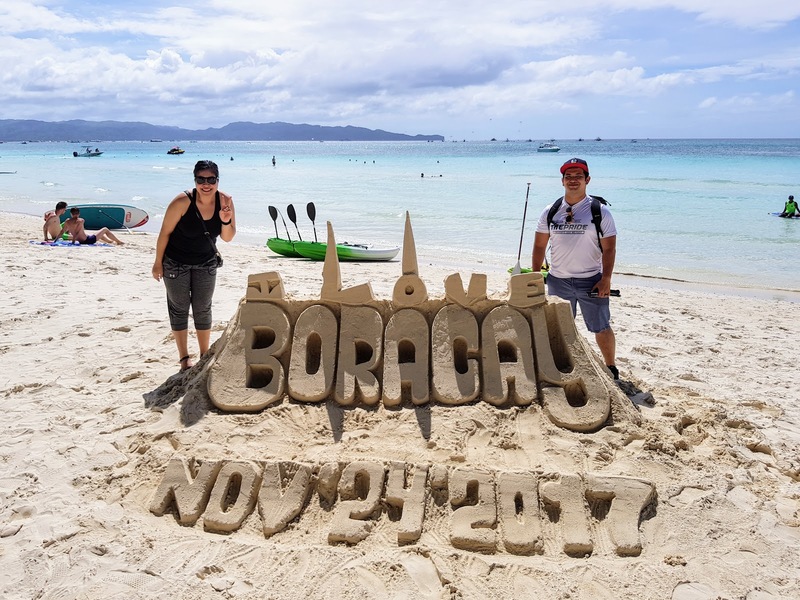 We traveled to Boracay and Manila over the Thanksgiving holiday. This was our first trip with friends and it was a great one. My wife was the only one that spoke the main native language dialect (Tagalog) which helped us out immensely. Getting a SIM card for your phone is easy and free. Globe Telecom and Smart are the two carriers that we found outside the airport terminal. If you travel with Philippine Airlines they give you a voucher for some free data and minutes. I have used Globe before so I went with them. We spent about ₱1000 for 8 gb of data and about 15 minutes of call time. We were going to be using WhatsApp as our main communication app and decided to go with more data instead of call time. We had to take multiple airlines to get to Boracay. 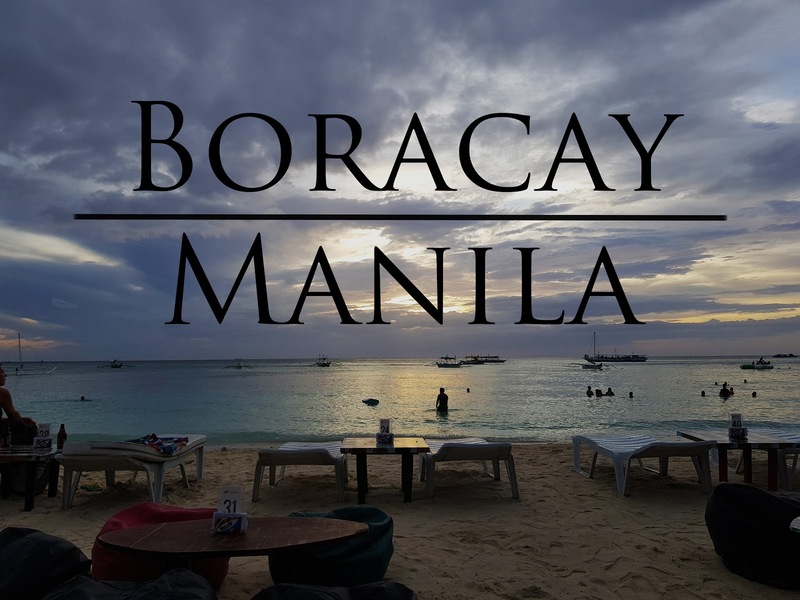 We flew into the Philippines on Philippine Air, purchased a one way from Manila to Boracay (Caticlan Airport) on Cebu Pacific Airlines and purchased another one way from Boracay (Caticlan Airport) to Manila on Air Asia. All airlines were great and we had no issues. 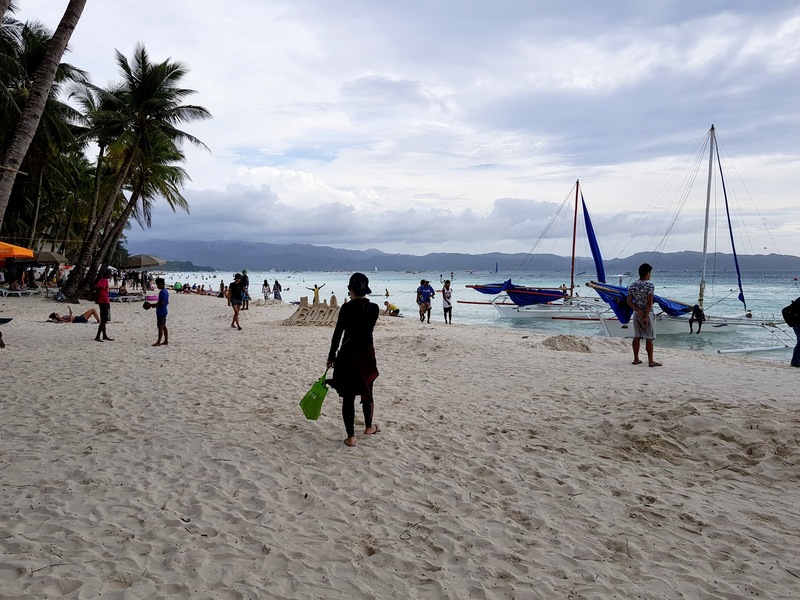 Getting to your hotel or villa in Boracay can be difficult especially if you do not speak the language. The company that we used to transport us was Southwest Tours. Cebu Pacific Airlines had a promo for ₱ 500 for drop off and another ₱ 500 for pick up. This covered your ferry ticket as well. The employees walked you through the whole process making this part of the trip easy. If you want to book with them, they have a small kiosk office outside of the Caticlan Airport. Travel time from airport to our villa was about two hours. Getting around Boracay is not bad. Their are no taxi cars, instead they had tricycles. They were everywhere and not hard to hail one. It’s very inexpensive about ₱ 60 a trip. If you’re in a large group try to get one of the electrical tricycles. These seat six to seven fairly comfortably. In Manila we used the Grab Car/Grab Taxi app to find rides. Uber is also available in Manila but it was a bit more expensive and didn’t use it. Our Boracay home was the Hayahay Villa on Diniwid Beach Road. It was a nice place with a lot of room for our group of seven. It was very quiet at all times of the day. It is not on the famous White Beach but it is a short commute to any of the stations. Also Diniwid Beach is a short walk away, about five minutes. Our Manila home was a flat in Mosaic Towers. 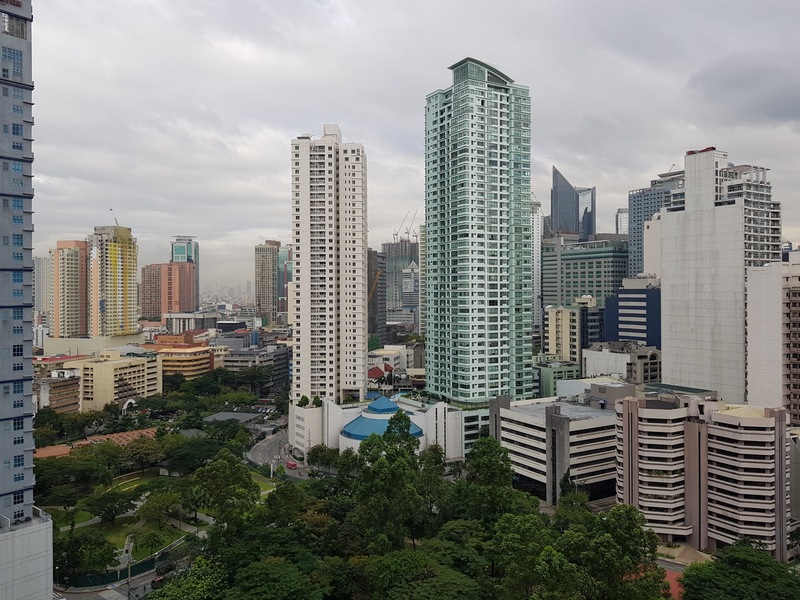 The location was great (Makati) and our host was very quick with responses to our questions. This area felt very safe and even had a small coffee shop on the first floor. White Beach is the most famous beach in Boracay, with a length of about two miles. This beach has very fine sand and clear blue water. You can find some sand sculpture artists and a bunch of tourists walking the beach. Their are a lot of restaurants lining the beach and a lot of small food vendors as well. At night the beach changes and becomes a party scene. The downside of this beach are very few. Their are a lot of people trying to sell you something everywhere. You can’t walk 10 ft. without someone trying to sell you hats, sunglasses or a tour. The other downside is how crowded it can be. Diniwid Beach is a small beach north of White Beach. It’s the closest beach to our villa so we decided to check it out. This beach is a bit more secluded and less crowded than white beach. A few restaurants are in the area as well as a few bars. This is a great beach if you want to get away from the crowd. 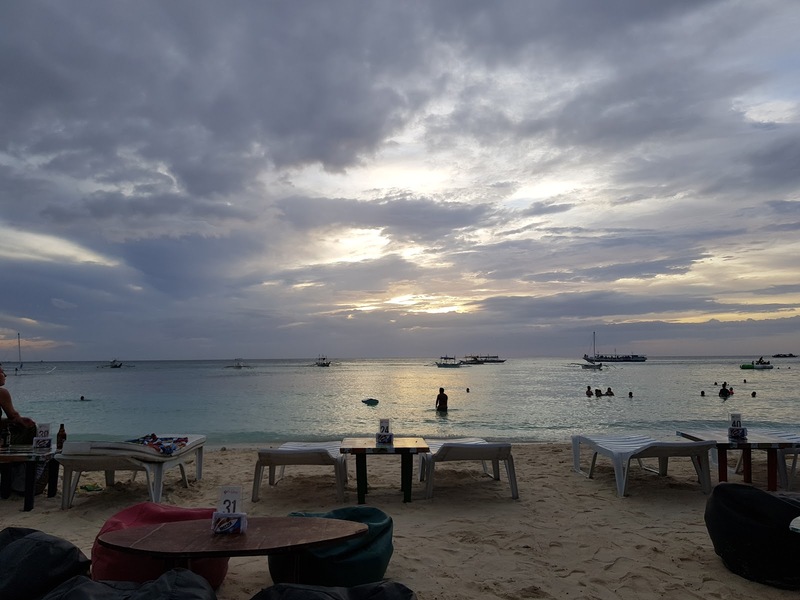 The Boracay PubCrawl introduced us to the the Boracay night life. The tour costs ₱ 1000 and consists of five stops at five bars and five shots on the beach. You also get a shirt, a rubber bracelet and a shot glass attached to a necklace. The group of participants are separated into teams and go through some bonding games. The tour lasts from 7:30 pm to 1:30 am so bring your energy, it’s going to be a long night! The great part about food in the Philippines is that it’s very inexpensive when compared to the US. 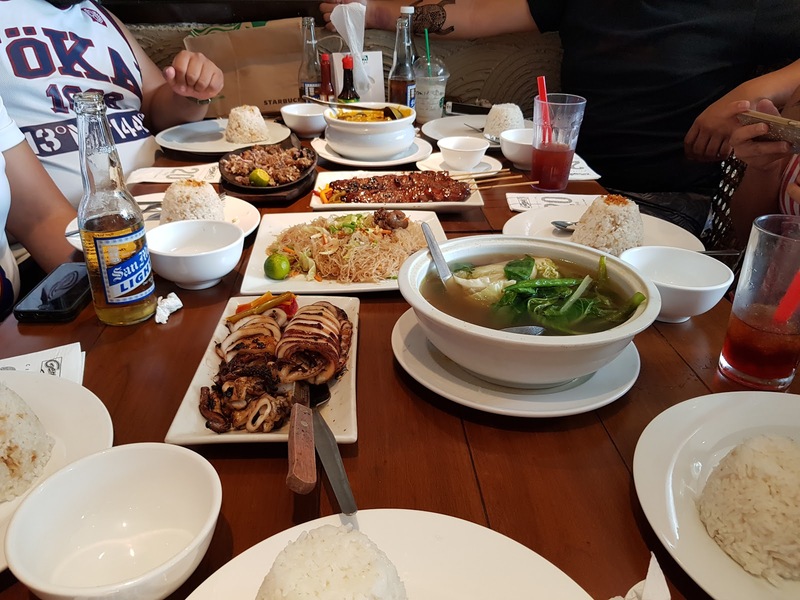 We tried a bunch of stuff but my favorite restaurant in Boracay was Gerry’s Grill. It’s a Filipino restaurant with others spread throughout the Philippines. We tried a variety of dishes. My favorite dish was the crispy pata. We also tried a few other places like Wokeria and McDonald’s. We would get small snacks and desserts that are along the beach. 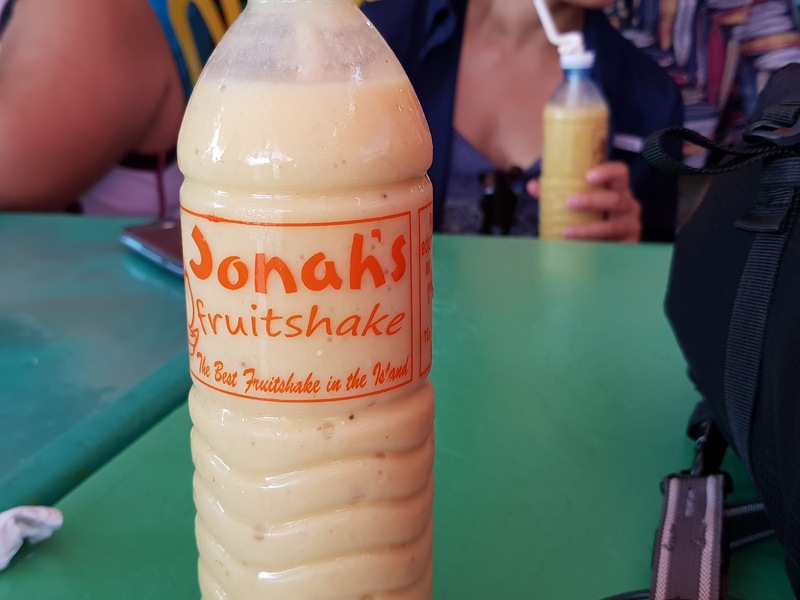 My wife and friends would stop by Starbucks every day to get some coffee and we stopped by a fruit shake stand called Jonah’s. The fruit shakes were awesome and they have a huge variety of fruit drinks available. If you’re looking for alcohol, just pop into a bar or a local market. Most drinks are very cheap about ₱ 50 for a bottle of San Miguel or Red Horse. Some bars even offer happy hour specials. We drank a lot during this trip. Their is no shortage of shopping malls in Manila. We were only able to visit a few. We stayed across Greenbelt Mall and Glorietta Mall in Makti. These malls would take a few days to walk through with each being three to four stories each. Other malls fairly close by were Uptown Mall, Mall of Asia and the Venice Grand Canal Mall. All these malls have the same stores and are quite large. The Venice Grand Canal Mall also has an Italian gondola ride! Their was so much food on this trip, I’m pretty sure I gained 10 lb. We drank a lot of Starbucks and ate plenty of doughnuts from Krispy Kreme and J. CO. Manila also has a lot of choices if you’re willing to brave the crazy traffic. We stayed near Glorietta and had to try out Tim Ho Wan, a famous Dim Sum restaurant from Hong Kong. It has been called “the cheapest Michelin-starred” restaurant in the world and it did not disappoint. The menu is printed on paper that also acts as your place mat. Most items have a picture and you order by writing down the menu numbers on a pad next to your table. We tried a bunch of items on the menu and loved everything. We would have ordered more but we were stuffed. There are five other restaurants in the city if you’re not near Glorietta. 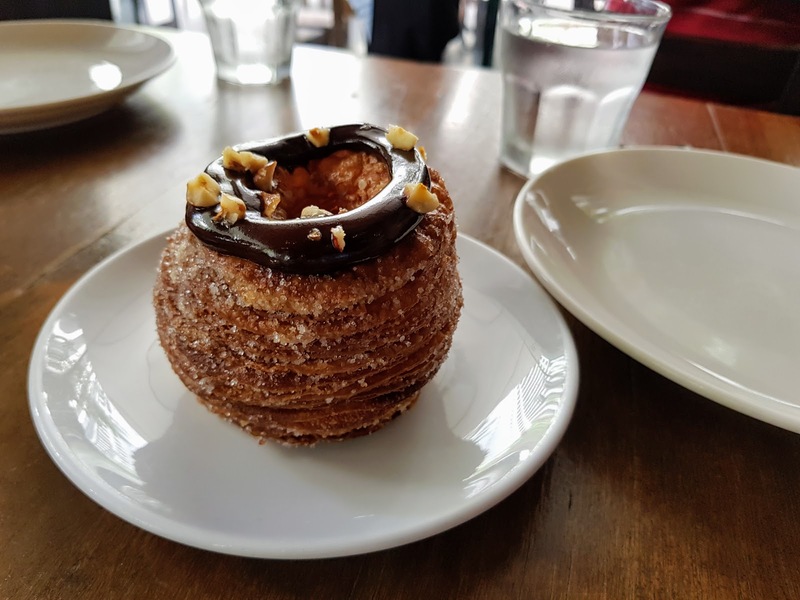 Wildflour cafe and bakery was a top suggestion by friends who frequently go to Manila. They recommended their pastries, especially the Cronuts. I’m not a huge pastry person but I was interested in their other breakfast options. Everything tasted great. The bacon steak, fried potatoes and eggs were tasty. The pastries were delicious as well. CrossFit 1229 was around the corner from our AirBnB. They were out of t-shirts in my size but I was able to pick up a shirt for my wife. It’s a small box but it looks like it had everything you would need to train. Next time I’m in Makati, I’ll do a workout. Neutral Grounds was also near our AirBnB in Makati. 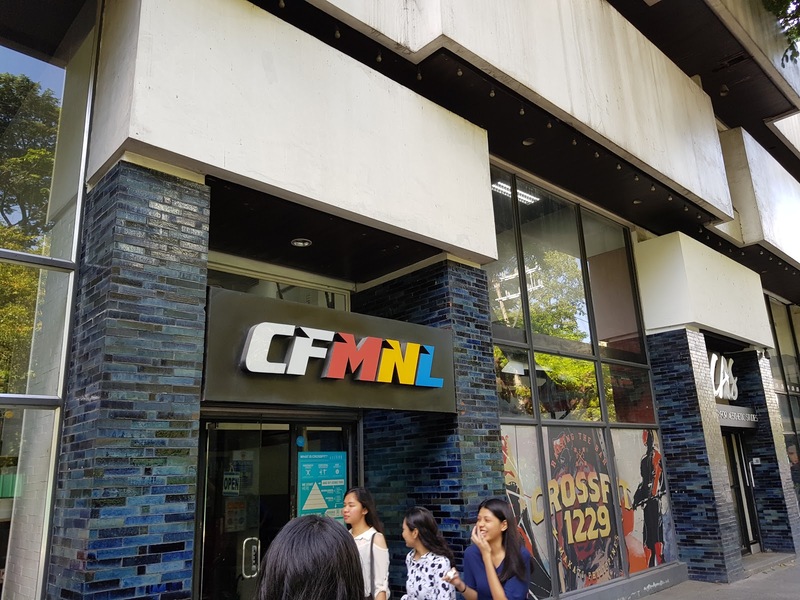 Located in Glorietta 4, this was a hard place to find. The mall is huge and we had to ask a few people where it was exactly. 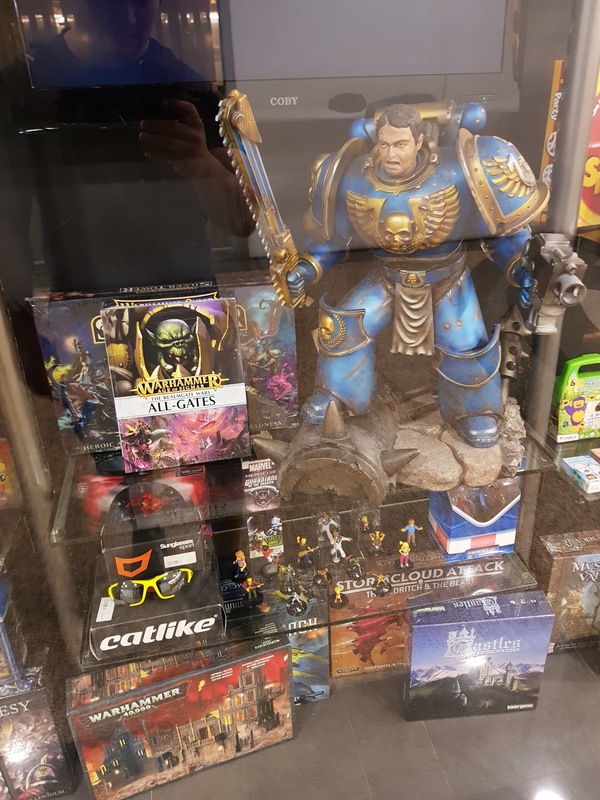 They had a few board games, some wargaming supplies and Games Workshop times. They had a good supply of MTG stuff as well. Boracay was a blast and had a great time. We enjoyed walking down white beach (except for the street vendors), eating at the various restaurants and drinking by the beach. It’s not a shopping island so don’t expect to find large retailers here. 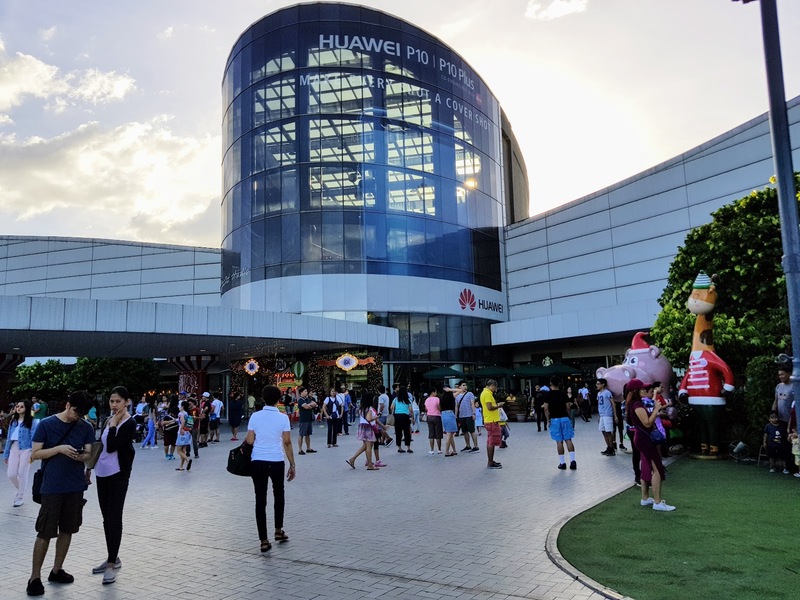 The biggest mall is an outdoor style area and the indoor mall doesn’t have a lot of stores. Since traveling to the island is long ordeal, I do not think we’ll be returning for a second visit. This was also my second trip to Manila. We had a great time walking through Makati and Bonifacio Global City. Manila can be a sketchy place but we felt safe in those areas. It was relatively easy to get around and the restaurants were great. If we have the time (and money) we will definitely be coming back. I wish I was able to surf here. I’ve never done it and I’ve been wanting to try it out. We were looking for things to do and didn’t see surfing. It might be on a different island. We only spent a few days here so I’m not sure if we would have had the time. Need to look for the best surfing spots in the Philippines and see if I can make it there. I’ll look for that surf camp as well. Very possible, I’ve heard the hardest part of exploring the Philippines is deciding between the thousands of islands. It may be on backpackerbanter’s website!